This week at Eau Brink Studio as been a bit of a roller coaster of a week. Sorting out the studio has been a big priority as it is a mess after all the fairs so far. The children at school enjoyed making these wizards. The mess was unbelievable but they had fun. I am thinking of spiders and cobwebs this week for them. Pompoms and pipe cleaners for the spiders. Not sure about the cobwebs as yet. But I am sure it will come to me. Cas Holmes will be arriving on Friday evening ready for our exciting two day workshop with her. That will include using found materials, mark making and stitch. It also means loads of cake. Cas will be bringing copies of her latest book for you to look at and if you have not already done so there will be a copy or two for sale. Cas is happy to sign her books. So if you already have one please do bring it along with you. I have had some major issues with emails not being received or going into the spam folders. Please check to see if you have missed any and tell your computer it is not spam. My computer guys are on it. I will keep you posted. Please do check the website for workshops as I am now putting on next years. I am aware that there is an issue for those of you with codes to put in. I am sorry it is not working. The computer guys are also looking into that for me. It will be sorted once they work out what the problem is. Clare Hedges Passementerie workshop has spaces in October. to book just follow the link. 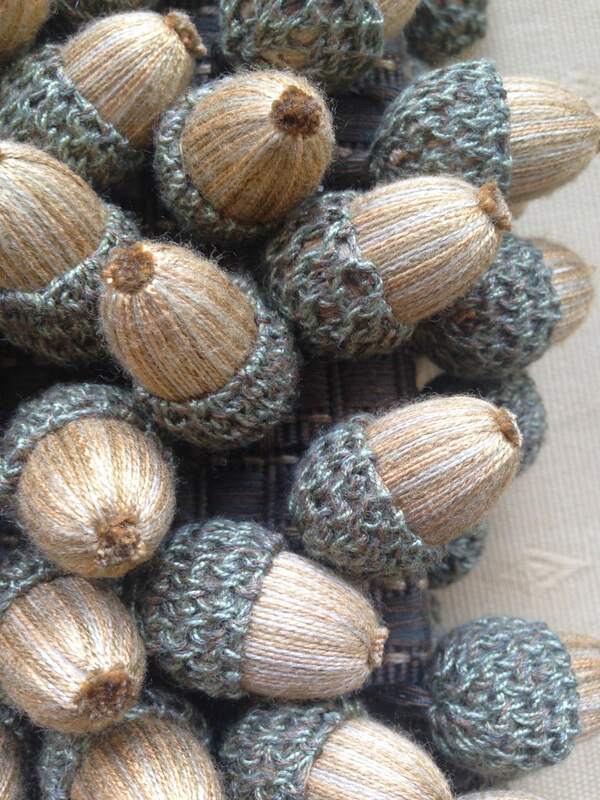 It is two days of learning how to make braids, tassels, and those lovely little acorn tassels too. 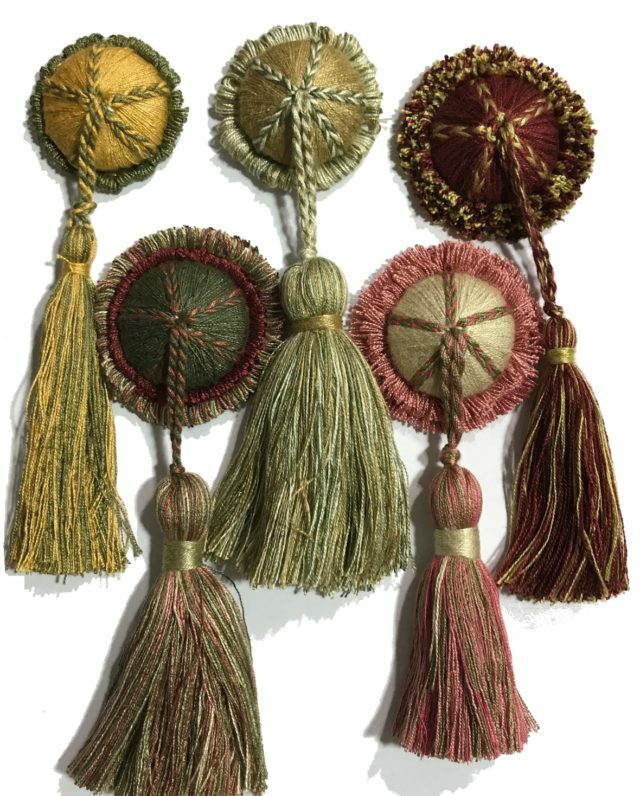 Passementerie is one of the crafts that is on the endangered list and is in need of some love to stop if from disappearing for ever. Clare works with the heritage charities, the V&A and heritage homes in private hands to keep their collections looking like the original furnishings. She matches the colours and fibres to make the replacements. Next years programme is now being added to the calendar so book early to ensure your place. This week we at Eau Brink Studio have been attending fairs at Wymondham and Hampton Court Palace. Although a very busy time we have had great fun. 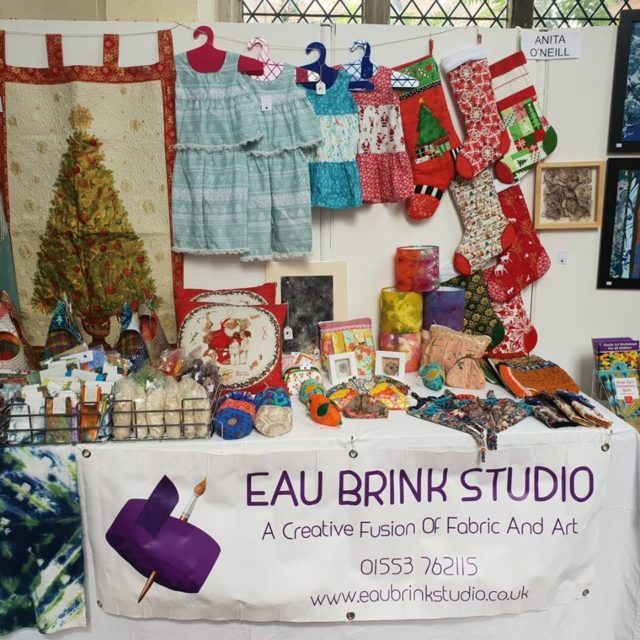 Wymondham has been a two week event of displaying our Textiles and of course selling them. 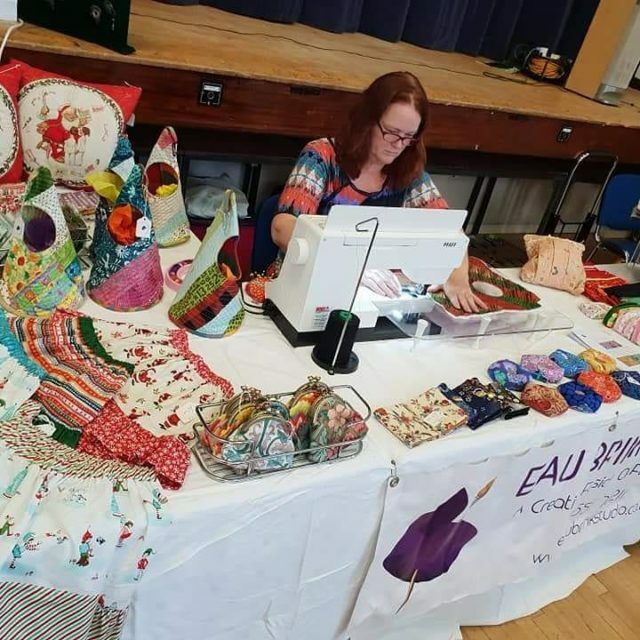 The King’s Lynn Embroiderers Guild had many items from our members to showcase the work we make and to encourage new members. Wow what a roller coaster of a weekend this turned out to be. Thursday we packed up the van and trudged off to London. We made good time until we were near Hampton Court and then the traffic was horrendous. John and I agreed we would never complain about the traffic in King’s Lynn again. We duly awaited our allotted time to unload and then set up the stall with many other traders all working together to help each other. there was also a team of maintenance guys to help too. And of course the Health and Safety guy was wondering along ensuring we complied to the rules. And here we are all set up and ready for the Friday mornings start. Friday we had to be sure all was okay by 9am. Meaning we were there at 8am making sure that all the items were priced and we had enough packaging if needed. 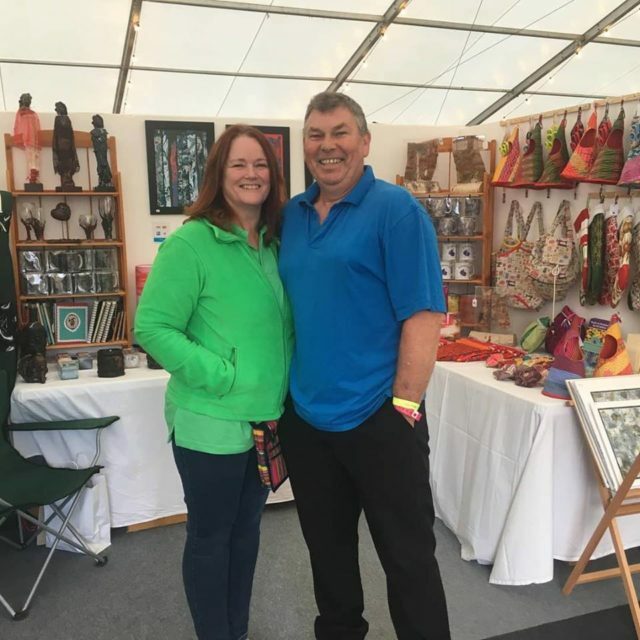 Kirstie spent time wondering around looking at all the stalls and chatting to the stall holders until she opened the event at 09.30. She was around for the entire three days and on the Saturday evening hosted a social event for the stall holders. As the early mornings and long days kick in by the end of day three the thought of driving home is not a pleasant one. Of course we did get stuck on the M25 in very slow traffic. As we reflect on the busy days and the lovely people we have met it was a great experience. I was particularly pleased to see the people from Norfolk who popped in and said hello. Thank you for your support. Of course it was very difficult not to go shopping myself.I have only bought a little bit of fabric, a pattern or two. John ought me a lovely pair of warm silk fluffy slippers. Not bad really. Cas holmes will be here on the weekend of the 29th of September. her course is full but I will see what we can get her to do next year. Probably earlier in the year. I will be updating the website of the next few days with other coursed that will range from one to two days. Including Melly Made lampshades for the new year. This one will be over two days so you get to finish your masterpiece. I am looking at starting another group for Experimentals as the group that meets on the first Wednesday is getting rather full. My plan is that if we have two meeting dates then everyone can switch between the two and get to know each other. That way if you miss a date you can catch up with the other group. From the 1st of October I will be selling items and planning small workshops in the Barn at Long Sutton. I am really looking forward to this as I have been waiting for a space for some time now. Also at Le Strange Barns in Hunstanton I am supplying more of my items as they keep selling out so a bigger space has been allotted to me. 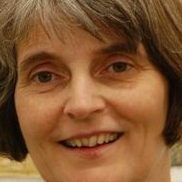 The King’s Lynn Embroiderers Guild are holding a workshop at Eau Brink Studio by Moira Neale. Fabric faces will be on the 20th of October from 10am till 4pm. There are two spaces available for this day. If you would like to book please contact Christine on [email protected] who will be able to help you. The cost is £35.00 for none members and £30.00 for Embroiderers Guild Members. You will need to give your membership number on booking. Here is a little snippet of what will be going on..
On this workshop we will concentrate on making just the faces. You may prefer to make one large one or two or three smaller versions. If there is time you could add clothing too. I will be showing you how to free machine and there will be plenty of opportunity to practice before working on your faces. This workshop is a bit of fun….the wonkier your stitching, the quirkier the result! Just come along and enjoy the day and learn how to make faces to include in your quilts or to make a gallery of your friends and family! Fairs Galore for Eau Brink Studio during September right from the start. First off was the Rainbow Fair at Downham Market. Whilst there I spent time demonstrating how to make peg bags. Many customers were interested in the cone shaped peg bags asking about the different processes involved in the making of them. It was a great day full of music and laughter. On Monday the textile exhibition started at Wymondham and runs until Sunday 16th of September. Set up in the Arts Center at the bottom end of the town. There are many artists showcasing their textiles including the King’s Lynn Embroidery Guild. The work there is stunning with a wide variety of items for sale. Well worth a visit. Sunday the 9th was also the towns Vintage day and we had great fun listening to the old music and looking at the vintage vehicles. Many people look fabulous as they wore vintage clothing for the event. It was a very busy day for everyone. 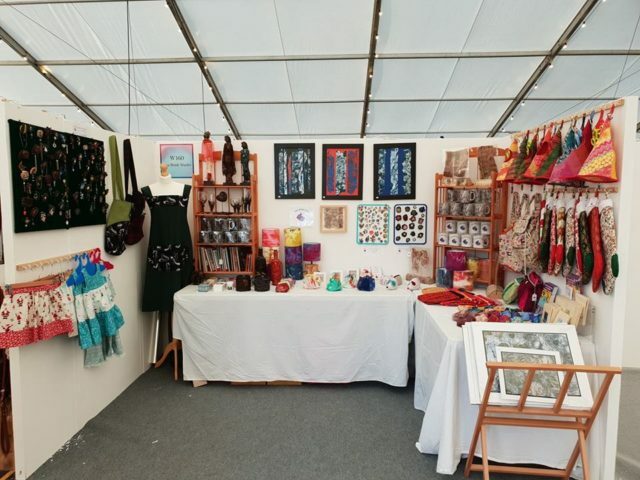 Coming up on from Friday the 14th is The Handmade Fair at Hampton court Palace. I am really looking forward to this on as I love Hampton Court Palace. We will be setting up on Thursday ready for the Friday Morning start. There will be two large shopping villages set up. One for handmade items for your home. Fabrics and other items will be in there too. The second will be full of lovely foods and drinks. Very hard to resist. Whats great is that there are several of us from Norfolk going so we can support each other during the show. I also know that there is a coach full of people going from Norwich. looking forward to seeing you all. If your planning on going I can help you with a free ticket. Just follow this link https://bit.ly/2MWKRB2 and you can register for a ticket to print off. They are limited so it is first come first served. I have already sent this link to others so don’t miss out. New mug and coaster sets have arrived. Some of you may recognise this design as it is the Fungi design we worked on from the Maggie Grey Wow book during our Experimental Wednesday. 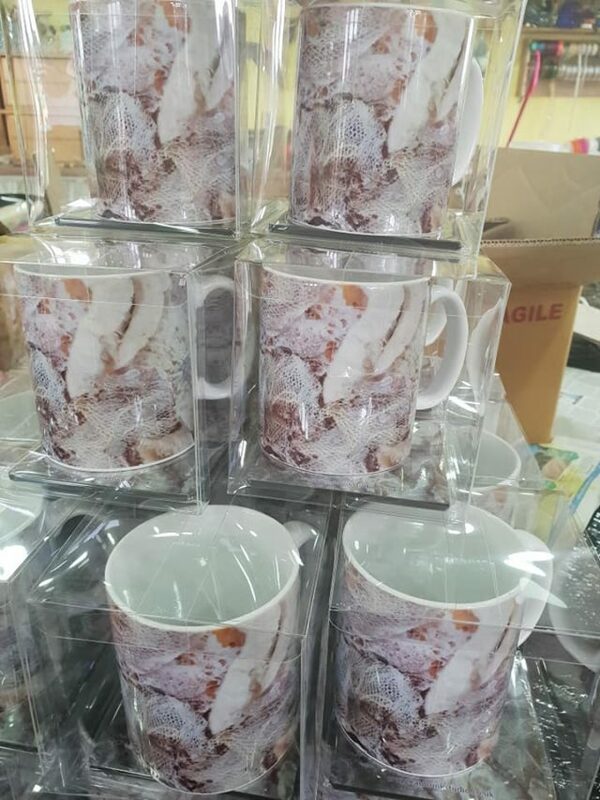 There is one other design at the moment which is taken from the pictures using Xpandaprint and Scolabrush. They do both compliment each other.